If the latest rumors can be believed, the folks at BlackBerry are close to rolling out an entirely new operating system that will offer some welcome features like full multitouch functionality. BlackBerry-maker Research In Motion is also reportedly working on a new clamshell device, its second after the Blackberry Pearl Flip , that will be capable of running the new OS, version 6.0. The Blackberry leaks come courtesy of gadget blog Boy Genius Report , which acquired images of the new phone and screenshots of the purported new operating system from an anonymous source inside AT&T. Image courtesy of Boy Genius Report. At first glance the purported OS 6.0 home screen doesn't look all that different from the OS 5.0 interface. The new home screen features a customizable wallpaper, and transparent icons for basic functions like SMS, Mail, Web browser, calendar, and so on. However, BGR says the new home screen will be fully customizable, and the organizational structure sounds like a mix between iPhone and Android devices. Just like the iPhone, you will organize your apps onto separate pages, and then flick or navigate to the next page. This makes it possible to have numerous apps on your device, without the hassle of crowding them all onto one page. But similar to Android, Blackberry OS 6.0 will use a 'drawer' where some applications on the home screen are hidden from view. To access the apps, you slide up the apps section from the bottom of the page. Blackberry is reportedly getting a new Webkit-based browser that includes tabs similar to the recently released Opera Mini for iPhone . There is also a new Media player that has am iPod Touch-like look to it with Cover Flow-style navigation, and a transparent overlay for touch-based playback controls. Other interesting features from Blackberry OS 6.0 include kinetic scrolling, where the OS reacts to how fast you flick the page when scrolling, allowing you to get through a long screen of text more easily. The interface will also feature so-callled "rubber banding" where a page bounces when you reach the bottom or top of a page. Multitouch is also reportedly coming to Blackberry OS 6.0 including features like pinch to zoom, which just might raise the hackles of multitouch patent holders like Apple or Taiwan-based Elan Microlectronics . BGR believes the new OS will be launching this summer, and says it could be ready as early as June. Those predictions seem very optimistic considering RIM just launched Blackberry OS 5.0 in late 2009. 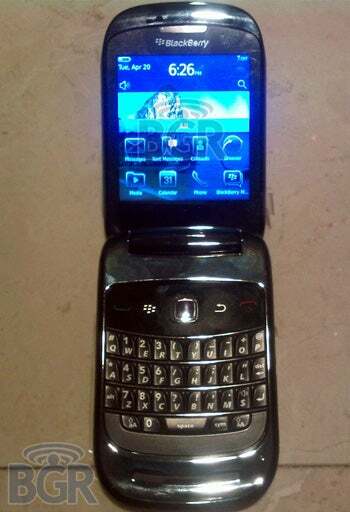 In addition to Blackberry OS 6.0, BGR was able to get its hands on a what it says is a new Blackberry clamshell device called the Blackberry 9670 . The CDMA handset reportedly features a 5 megapixel camera, full QWERTY keyboard, Wi-Fi connectivity, internal and external displays, and a microUSB port. There's no word on pricing or carrier, but since it's a CDMA device Sprint and Verizon are the only two contenders. What do you think, Blackberry fans? Any Pearl Flip users out there ready to trade up for the 9670?